Donations of money, time or goods & services all help us make a change to an animal's life. Please keep your fingers crossed for Alfie. He's not doing so well. 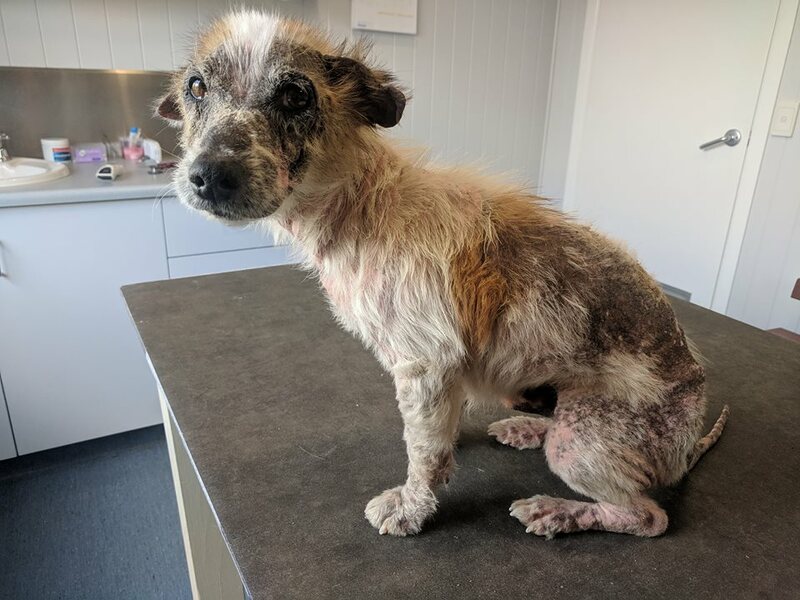 Not only was this poor dog found wandering on the street in revolting condition, he's now gone downhill and requires surgery. He was found with mites on his body, that had been there so long untreated he had infections and swelling. Cauliflower ears from long term infections, raw skin all over, blood in his urine. Within an hour of reaching us he was in our clinic and treatment had begun. That was a few days ago, and recovery had been slow but steady. But yesterday his foster noticed he had started to strain when he needed to urinate. So he was taken into the vet yesterday afternoon. We tried to put in a catheter, but at a certain depth he started crying. But he had begun to pee normally again- so he should be fine right, maybe he just got scared and that's why he cried? Generally what you'd do is just go home and monitor- after all he could pass urine fine, was otherwise going great and maybe this was just a weird habit he'd developed- but we decided instead to go gung ho and look further into it. Thankfully our vet is very diligent and wanted to investigate and was willing to give him the best shot possible. This morning Alfie has had the works. Anaesthesia, bloods, xrays and ultrasounds. I'm very grateful that I'm so paranoid, as it turns out he has a small stone. They've flushed it back up into his bladder, and are going to have to operate to remove it. If we don't, he's a ticking time bomb. They'll operate to remove it, send it away for testing, and the type of stone it ends up being will dictate what treatment and prevention options are available to us. His recovery will be slow since he's so sick and neglected already, but we don't have a choice. We do it now or he could die. Because next time this stone shows itself it could be bigger, or in the wrong position. Bill estimate is approx. $2,000 (gulb). But he's worth every cent, so we need to do our best. Alfie is a loving, spunky little boy who deserves every bit of help he can get. He's had a horrible few years living in unimaginable pain, but now is his time to find relief, love and a happy ending. I’m counting on you tonight to please help Alfie. Just $5 each will get us over the line. My fingers are crossed for this gorgeous little boy. He has made it this far he will win. I hope this poor little soul can be helped. This is just so heartbreaking to see. I hope dear little Alfie is fully recovered and finds his loving forever after home. God Bless. Wishing you a speedy recovery Alfie! For little Alfie, get well soon little man. You poor darling. Sending love get well real soon. Get better real soon Alfie, our hearts break for you dear little man.